Desks can easily become filled with clutter (staplers, papers, scissors, pens, sticky notes, etc. ), so investing in a desktop organizer can help keep everything in order and increase productivity. When shopping for one there are a few variables to consider. Space is usually the first consideration and then there are your needs and style. Still not sure which one is right for you? To help, we've rounded up the best desktop organizers to keep your space clean and functional so you can focus on your tasks at hand. The Valencia Stockholm Collection from The Container Store can be continuously built on depending on what you're looking to organize. Reviewers favorites from this collection start with The Bigso Desktop File which is 13" x 7.5". The matte paper exterior and paper-lined interior make for a durable box and it can accommodate letter-size hanging files. It also has a metal label holder. Many reviewers who chose this piece used it for important papers such as taxes and receipts. The Bigso Valencia Stockholm Paper Drawers measure 13" x 10" and they're good to store letters and documents you utilize daily. Self-Adhesive rubber feet can be placed on the bottom of the drawers to prevent sliding or any scratching. Since each piece can separately be purchased in this collection, favorites such as the storage boxes and magazine holders are durable enough that they can be placed above desk area on a top shelf or underneath the desk area. This three-piece acrylic desk organizer set doesn't take up too much space and includes a sturdy medium tray holder with three compartments to store papers and files. The main piece and measures at 11.75" in length and 3.5" in width. It also includes a notepad holder for post-its and small essentials such as push pins or paperclips, as well as a cup holder for pencils and pens. This set is ideal for the person who uses their desk as an extension of their work life and requires the everyday items at arm's reach. The acrylic style allows your desk area to look clutter-free and clean. This multifunctional desktop organizer measures 11" x 6", so it's not cumbersome and will sit perfectly on your desk. There are six compartments, as well as a small drawer (3" x 5") that can hold your office supplies and cell phone. The primary structure is made of wood and covered with faux leather; it's waterproof, durable and easy to wipe clean. The largest compartment is 5.75" wide, which makes this organizer ideal to house supplies and perhaps a small notepad. Reviewers love this piece and comments such as "holds an amazing amount of items" and "very impressed and highly recommended" show why this is a favorite. 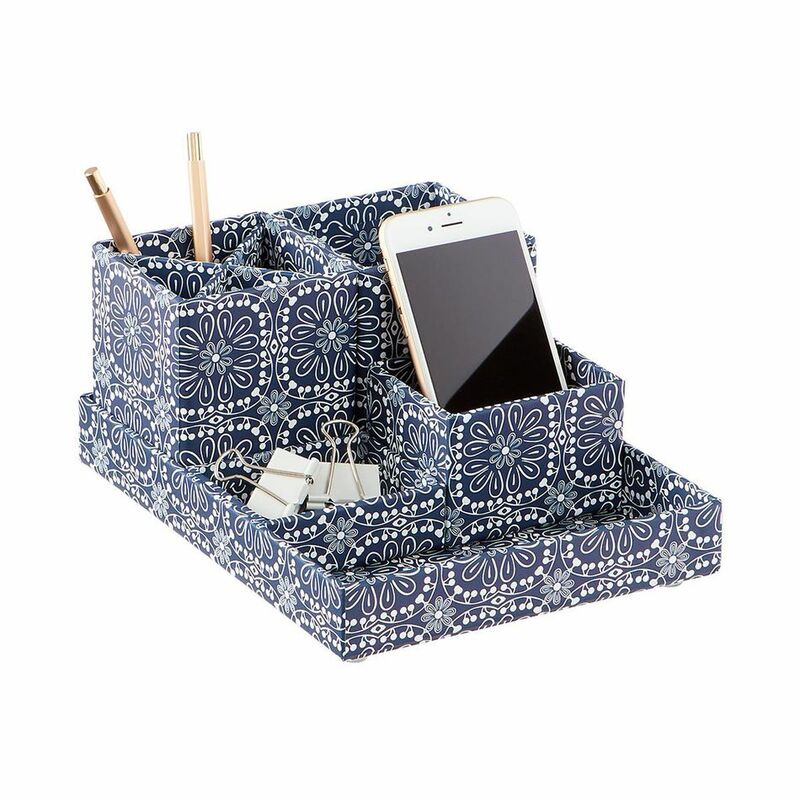 This organizer measures 15" x 11" x 13" and can comfortably fit into the corner nook on a desk. Used horizontally or vertically, it is ideal if you need to utilize your desk for a computer and are limited with space. Vertical positioning can store flat large files and binders. Reviewers note this organizer for helping to keep their desk area clutter free and well organized. The brand Poppin is known for giving a modern twist to desk supplies. Designed to be functional and durable, these organizers are available in ABS plastic and safe silicone. Five-star reviewed items such as the Poppin Fin File Sorter pairs well with the Stackable Letter Tray. The easy to clean silicone organizers can store pens and pencils upright. If you're looking for a space for supplies such as a tape dispenser and stapler, try the Accessory Tray (it's stackable). Want something more stylish? Poppins products can also be purchased in a palette of colors such as turquoise and blush. This silver mesh desk organizer is designed as a double tray with five stacking sorter sections. At 13.3" x 10.3", this organizer is sturdy enough that a vast bulk of paper can be stored at the bottom or top tray. The organizer can sit in a vertical position and can fit in the middle desk area or a corner. The Yamazaki Nest Collection is a nice twist from the traditional wire basket look that we have seen for many years. This updated collection has a Japanese design and is made of steel with a matte finish. Your desk will be protected from scratches, thanks to foam feet on the bottom of the pieces.